LOVE's Haven: Vote for Righteousness! We usually hear from different media sources about the updates of the coming 2010 presidential elections that are controversial as early as of now. Well, truly it would be that hot since we have to make the right decision on who will take over to become the leader of our nation that is already decaying morally and experiencing economically bankruptcy because of great wickedness and deep corruption. As early as of today, I am so decided to cast my sacred vote for the righteous man. I don't compromise my vote for a lesser evil. They will still do evil things. I suggest, let us lift up a righteous candidate to give way for national cleansing and transformation and let us vote for righteous governance. If you are still undecided, there is a site which will help you to make wise decisions in this coming election through social networking tools such as blog, chat, political forum and multimedia portal. You can even read some articles about political issues if you happened to miss it on the news (TV,Radio and etc). PoliticalArena.com is powered by the global network of 88DB.com, an online classified ad portal, and JobsDB.com, Asia Pacific’s leading job portal. I know I can get lots of good informations from this site that would help me in so many ways through joining their forums, answering some discussions, even sharing my own opinion as a Mindanaoan blogger. I am already fed up with rugs to riches story of any presidential aspirant. For sure, we do not need traditional politicians who fill their mouth with promises, that is why as a Kagay-anon I would be so proud to stand up for righteousness through this site. By the way, I have taken the opinion poll with the question “The Most important issue in choosing your next President?” I choose the ETHICAL ISSUES! Let us vote for righteousness - for righteousness exalts a nation. thanks. 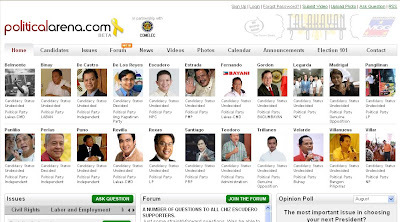 this will really help me in deciding who to vote for this elections. Stylish, chic and affordable you just can not conquer that!When it comes to fabulous fashion for girls, there is absolutely nothing far better than possessing a great purse. Kors in an work to enable individuals enjoy their Kors collections just a minor bit far more.In Michael Jordan's rookie seasons, his attacking scope is not large enough and he is a little loose at defense, Michael Jordan's fist coach in NBA said. Michael Kors realized and tapped the potential handbag market of the USA first. This post will just take a short search at this bag.I am NOT supposed to be getting this sloppy anymore. Not knowing what the upcoming song is during a performance is a dead give-away of an amateur singer. Hobo shoulder bags are shaped like a crescent moon, which have become super popular. There are many possibilities readily available from a variety of designer labels.Und trotz der Bauhhe verzichtet Dell auf ein optisches Laufwerk, packt aber einen sehr groen Ak . Barstools2u. Cross body bags can be small or large, and are perfect for traveling. MICHAEL by Michael Kors' 'Astor Patchwork' leather shoulder bag brings home the BoHo style with accent stitching and versatile relaxed tote design.